In 2018, we found 1941 individuals and organizations as an investor in companies impacting legal. Who is funding the legal industry? And Why now? If you kept an eye on the legal industry this year, you may have noticed something brewing. It started with an ICO craze we detailed in February and resulted in some outrageous announcements. Such as, Block.one raising $4 billion and then getting something extra from Peter Thiel, the billionaire founder of Legal Tech company Palantir. Fun fact: Peter is the most cited figure in articles on this blog. 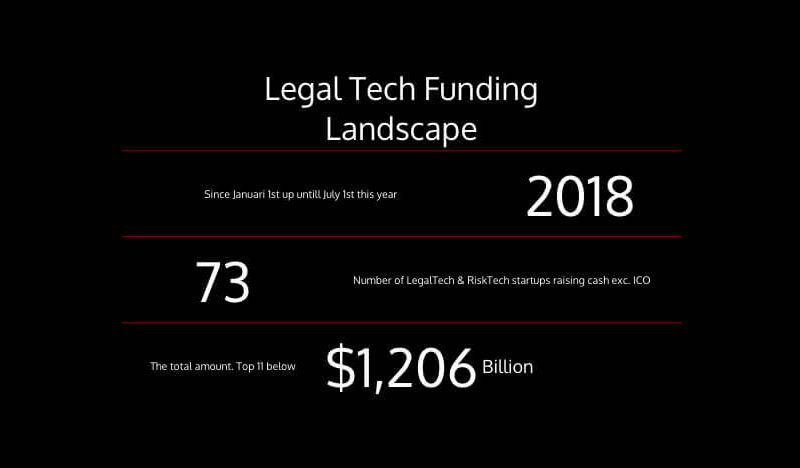 But things really got weird in June and prompted this: First Half of 2018 Legal Tech Raised $1.2 Billion in Cash. Stories began to appear that revealed stars like Mark Cuban and Kobe Bryant also dabbling in Legal Tech. Steve Balmer, the former CEO of Microsoft, is a charitable CivicTech investor who poured $59 million more into the sector this year. 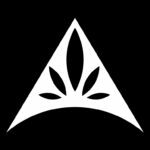 Atrium LTS had 95 investors for a record-setting first round in 2017 and doubled down with two more rounds this year to close at $75.5 million. To put this into context, the average number of investors in the legal industry is almost 6 per company. And it wasn’t just Legal Tech companies, RiskTech also got some love like Assent Compliance getting $100 million. 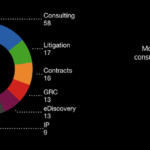 To keep pace, there is a new chart up on Legal Startups Charts with amounts raised each month. However, after absorbing these shocking numbers, I had more questions about the wave of cash and coin injected into this niche. One of the most reliable startup investing strategies is looking at where people spend a ton of money but hate the experience. If we view the legal industry through this lens I would imagine money to be flooding the sector every year. Our estimate of total funding raised in 2017 was around $385 million. But here’s what happened: this year kicked off with 34 fundraising rounds in January with a total of $123 million. That is about a third of the entire previous year and we’re talking about a single month. In hindsight, January actually was the slowest month so it may have set off another famous investment credo called FOMO (Fear Of Missing Out). 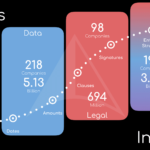 In April we had another trigger with the successful IPO by DocuSign, the first pure Legal Tech exit to the stock market I have witnessed. They also acquire SpringCM for $202 million to move deeper into the corporate legal workflow. Then LegalZoom dropped a $500 million round in July as a sign of a strong consumer legal market. This could have been the catalyst for another monster month in September with a total of $796 million. It took four months and two new datasets to answer some of these questions. Like how many received seed capital (109) and which investors (e. g. Goldman Sachs) don’t mind betting on experimental ventures. And which sector got more early investment? To my surprise, it’s a dead heat between RiskTech and LegalTech (47 each) and we still have a couple of good weeks left in this year. There also is a new ‘Data’ page which we’ll use to explain the general approach to our datasets. 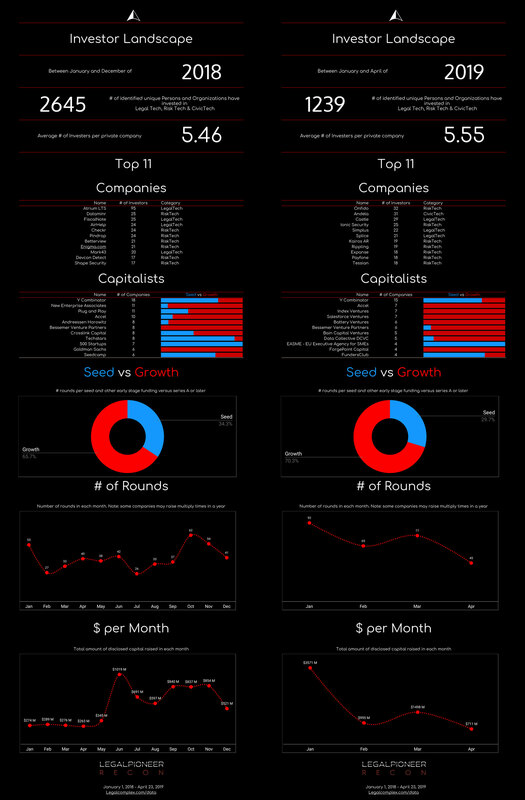 And if you were wondering why I abandoned our black & red scheme for this infographic, it’s because I was inspired by the real exit investors are looking for. Do you have questions? Just reach out to me on @Legalcomplex, Linkedin or email: Raymond[at]legalcomplex.com.